David Varadi have recently wrote two posts about Gini Coefficient: I Dream of Gini, and Mean-Gini Optimization. I want to show how to use Gini risk measure to construct efficient frontier and compare it with alternative risk measures I discussed previously. I will use Gini mean difference risk measure – the mean of the difference between every possible pair of returns to construct Mean-Gini Efficient Frontier. I will use methods presented in “The Generation of Mean Gini Efficient Sets” by J. Okunev (1991) paper to construct optimal portfolios. 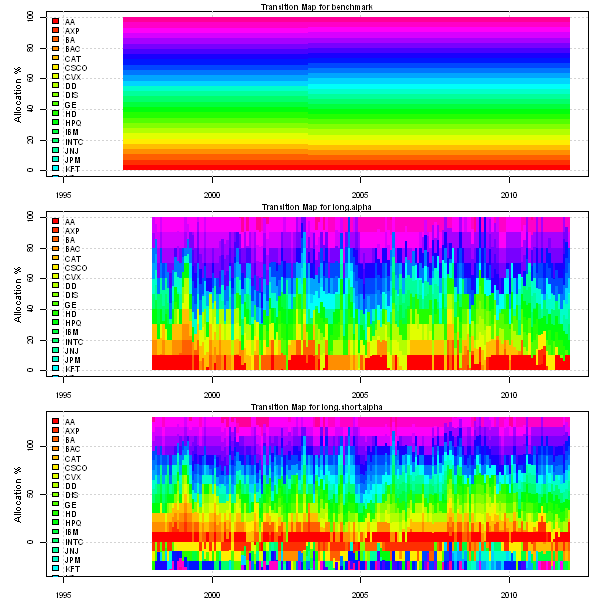 Let’s examine efficient frontiers computed under Gini and Standard deviation risk measures using sample historical input assumptions. The Gini efficient frontier is almost identical to Standard deviation efficient frontier, labeled ‘Risk’. This is not a surprise because asset returns that are used in the sample input assumptions are well behaved. The Gini measure of risk would be most appropriate if asset returns contained large outliers. To view the complete source code for this example, please have a look at the aa.gini.test() function in aa.test.r at github. 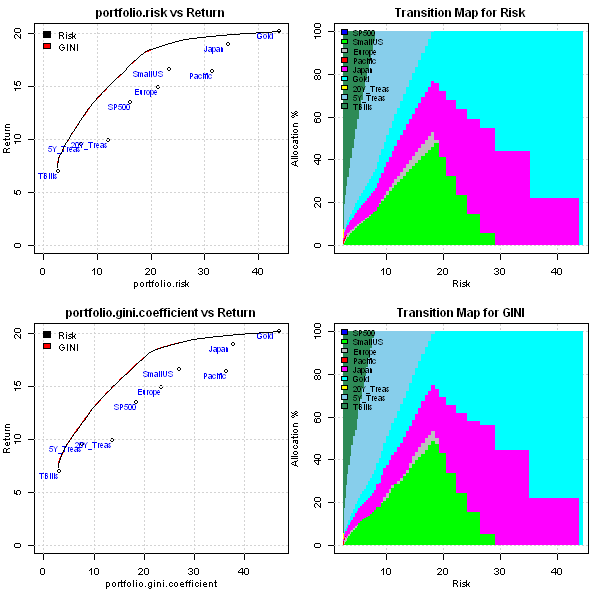 Next I added Gini risk measure to the mix of Asset Allocation strategies that I examined in the Backtesting Asset Allocation portfolios post. To view the complete source code for this example, please have a look at the bt.aa.test() function in bt.test.r at github. 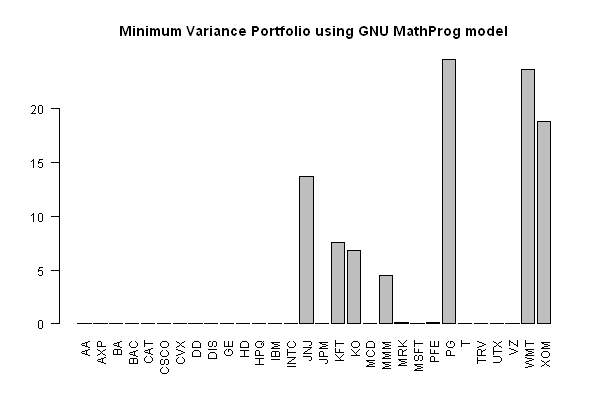 In the last post, Portfolio Optimization: Specify constraints with GNU MathProg language, Paolo and MC raised a question: “How would you construct an equal risk contribution portfolio?” Unfortunately, this problem cannot be expressed as a Linear or Quadratic Programming problem. I will show how Equal Risk Contribution portfolio can be formulated and solved using a non-linear solver. I will backtest Equal Risk Contribution portfolio and other Asset Allocation portfolios based on various risk measures I described in the Asset Allocation series of post. Next, I want to expand on the Backtesting Minimum Variance portfolios post to include Equal Risk Contribution portfolio and and other Asset Allocation portfolios based on various risk measures I described in the Asset Allocation series of post. The minimum variance (min.risk) portfolio performed very well during that period with 10.5% CAGR and 14% maximum drawdown. The Equal Risk Contribution portfolio (find.erc) also fares well with 10.5% CAGR and 19% maximum drawdown. 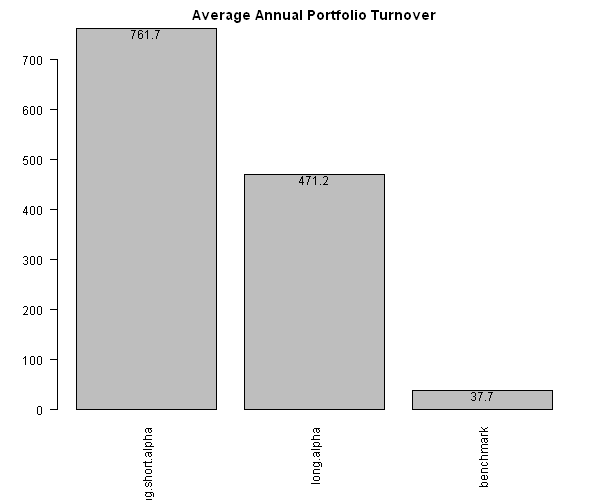 The 1/N portfolio (equal.weight) is the worst strategy with 7.8% CAGR and 45% maximum drawdown. One interesting way to modify this strategy is to consider different measures of volatility used to construct a covariance matrix. For example TTR package provides functions for the Garman Klass – Yang Zhang and the Yang Zhang volatility estimation methods. 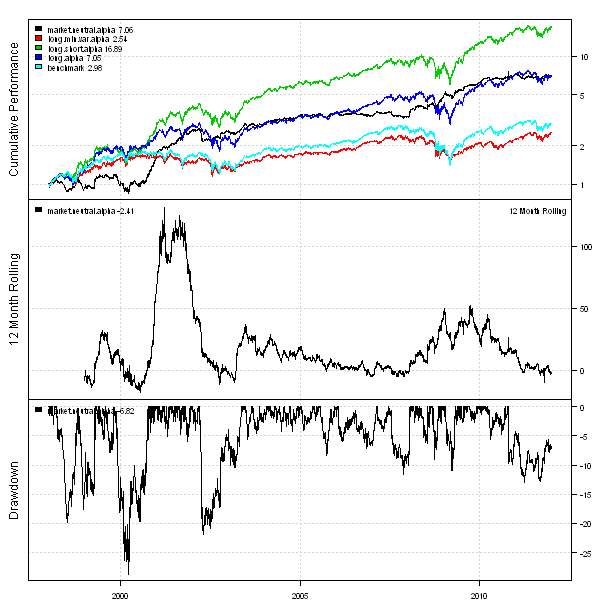 For more details, please have a look at the Different Volatility Measures Effect on Daily MR by Quantum Financier post. Inspired by the I Dream of Gini by David Varadi, I will show how to create Gini efficient frontier in the next post. Let’s start by solving a simple portfolio construction problem using helper functions to specify the constraints. 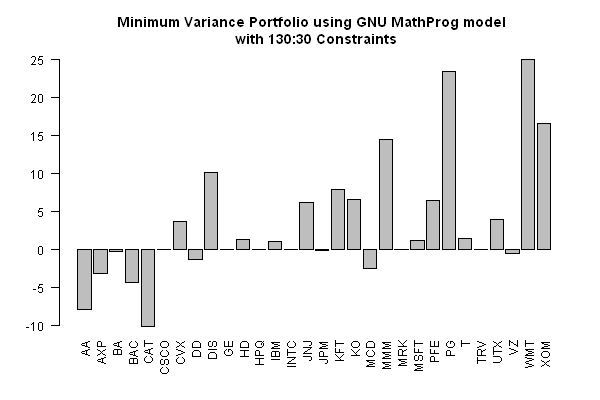 Next, let’s use this model to find minimum variance portfolio. BA and GE are held constant at 10% and other 8 stocks are traded with trade size at least 5% and no more than 20%. Please let me know what other type of constraints you like to impose during portfolio construction process. To view the complete source code for this example, please have a look at the portopt.mathprog.test() function in aa.gmpl.r at github. 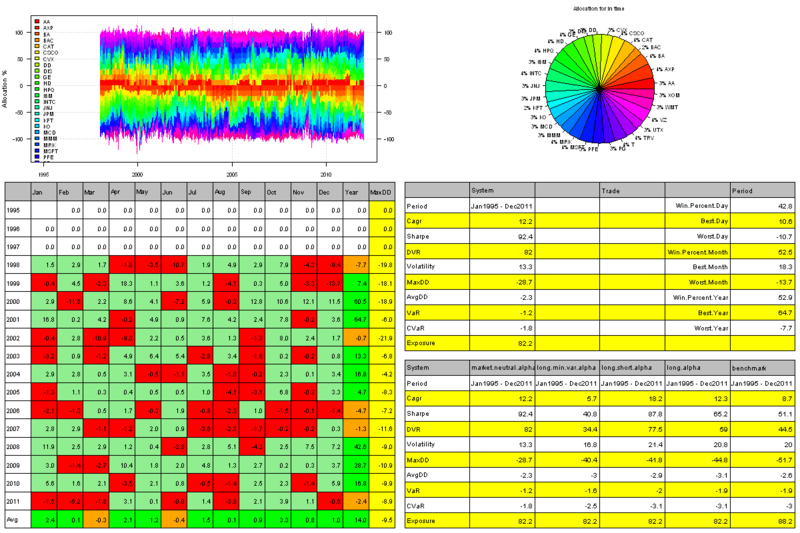 Multiple Factor Model – Fundamental Data – in this post I demonstrate how to get company’s Fundamental Data into R, create a simple factor, and run correlation analysis. Multiple Factor Model – Building Fundamental Factors – in this post I demonstrate how to build Fundamental factors described in the CSFB Alpha Factor Framework and compute quantiles spreads. For details of the CSFB Alpha Factor Framework please read CSFB Quantitative Research, Alpha Factor Framework on page 11, page 49 by P. N. Patel, S. Yao, R. Carlson, A. Banerji, J. Handelman. Multiple Factor Model – Building CSFB Factors – in this post I demonstrate how to build majority of factors described in the CSFB Alpha Factor Framework, run cross sectional regression to estimate factor loading, create and test Alpha model. Multiple Factor Model – Building Risk Model – in this post I demonstrate how to build a multiple factor risk model, compute factor covariance using shrinkage estimator, forecast stocks specific variances using GARCH(1,1). Portfolio Optimization – Why do we need a Risk Model – in this post I explain why do we need a risk model and demonstrate how it is used during portfolio construction process. Multiple Factor Model – Building 130/30 Index – in this post I demonstrate how to build 130/30 Index based on the CSFB Factors and the Risk Model we created previously. The 130/30: The New Long-Only (2008) by A. Lo, P. Patel paper presents a very detailed step by step guide to building 130/30 Index using average CSFB Factors as the alpha model and MSCI Barra Multi-Factor Risk model. 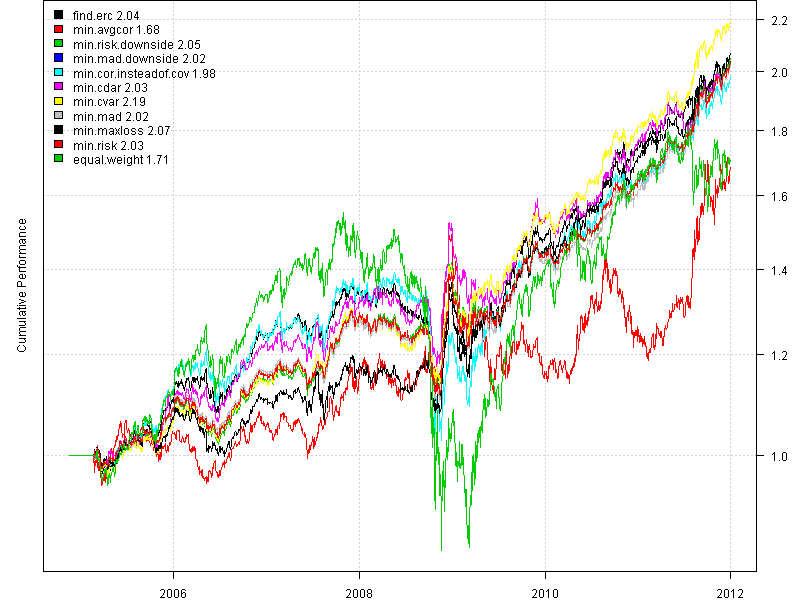 Multiple Factor Model – Building 130/30 Index (Update) – in this post I demonstrate how to build Market-Neutral and Minimum Variance strategies and compare their performance to the 130/30 Index. 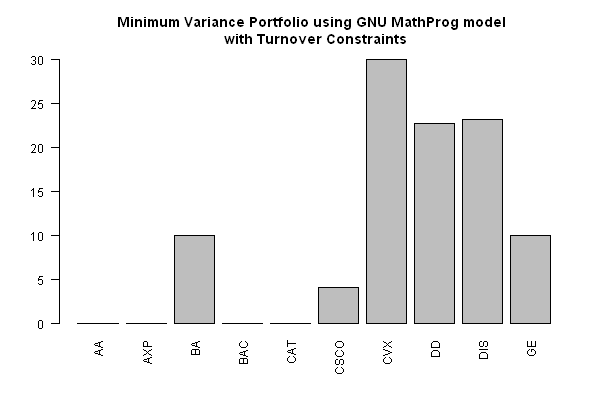 There is an excellent discussion of portfolio construction problems and possible solutions in the The top 7 portfolio optimization problems post by Pat Burns. I want to highlight two problems that are relevant to the Multiple Factor Models. Problem 3: The expected returns provided by Alpha model sometimes need to scaled or converted to be used in optimization. The Converting Scores into Alphas – A Barra Aegis Case Study (2010) by I. Gleiser, D McKenna paper provides a step by step guide. Problem 7: Factor alignment problem is present when different factors are used in the Alpha model and Risk model. An Empirical Case Study of Factor Alignment Problems using the United States Expected Returns (USER) Model – Axioma Research Paper (2011) by A. Saxena, R. Stubbs paper investigates this problem and proposes an alternative portfolio construction methodology. 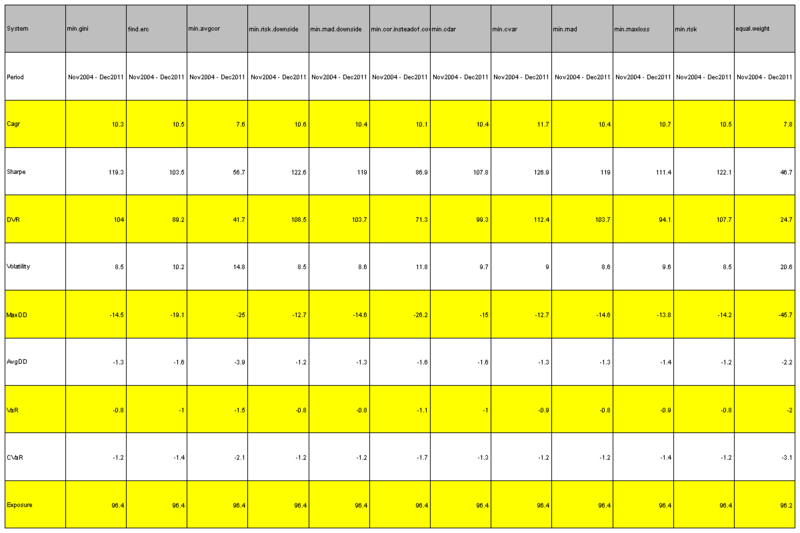 This is just a quick update to my last post: Multiple Factor Model – Building 130/30 Index. 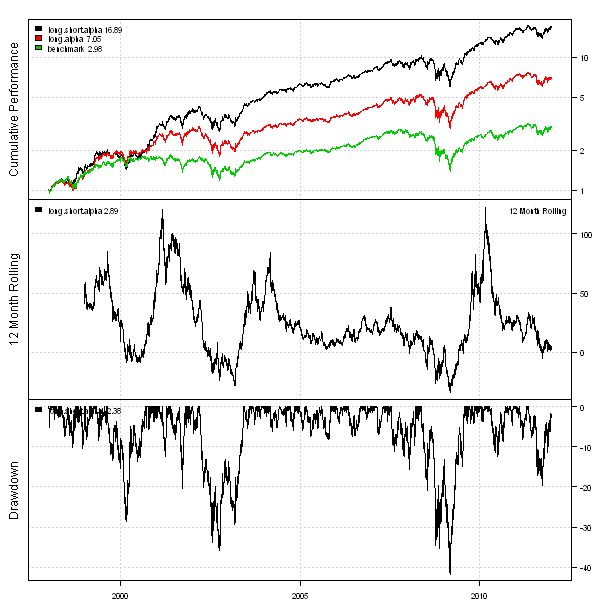 I want to introduce Market-Neutral and Minimum Variance strategies and compare their performance to the 130/30 Index. I have updated the source code of the fm.long.short.test() function in factor.model.test.r at github to include Market-Neutral and Minimum Variance strategies. Let’s start by creating a Minimum Variance strategy. I will use the same framework as in the Multiple Factor Model – Building 130/30 Index post. 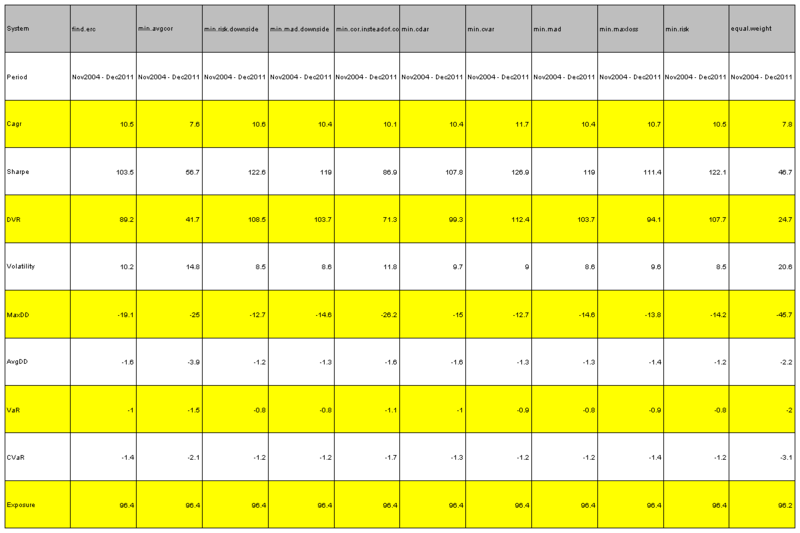 At each month end, I will solve for a portfolio that has minimum variance, ignoring all alpha information. Next, let’s construct Market-Neutral portfolio. I will restrict portfolio weights to be +/- 10% and will use portfolio construction technique that I documented in the 130/30 Portfolio Construction post. # AS-CF risk aversion ratio of 1. 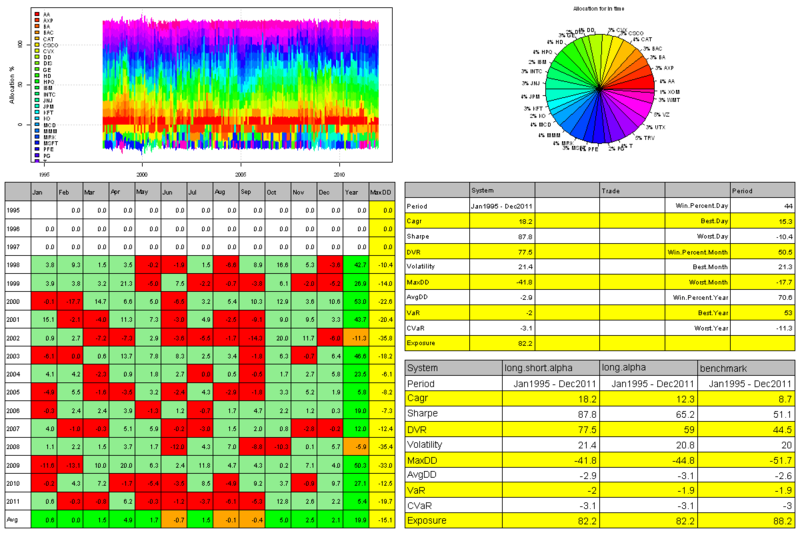 Next, let’s re-create all summary charts from the Multiple Factor Model – Building 130/30 Index post. To view the complete source code for this example, please have a look at the fm.long.short.test() function in factor.model.test.r at github. Nico brought to my attention the 130/30: The New Long-Only (2008) by A. Lo, P. Patel paper in his comment to the Multiple Factor Model – Building CSFB Factors post. This paper presents a very detailed step by step guide to building 130/30 Index using average CSFB Factors as the alpha model and MSCI Barra Multi-Factor Risk model. Today, I want to adapt this methodology and to show how to build 130/30 Index based on the CSFB Factors we created in the Multiple Factor Model – Building CSFB Factors post and the Risk Model we created in the Multiple Factor Model – Building Risk Model post. Let’s start by loading the CSFB factors that we saved at the end of the Multiple Factor Model – Building CSFB Factors post. [If you are missing data.factors.Rdata file, please execute fm.all.factor.test() function first to create and save CSFB factors.] Next, let’s load the multiple factor risk model we saved at the end of the Multiple Factor Model – Building Risk Model post. [If you are missing risk.model.Rdata file, please execute fm.risk.model.test() function first to create and save multiple factor risk model.] Next, I will compute betas over a two-year rolling window. Please read The Effects of Risk Aversion on Optimization (2010) by S. Liu, R. Xu paper for the detailed discussion of this optimization problem. Please note that I will use risk.aversion = 0.0075 and portfolio beta = 1 as discussed on the page 22 of the 130/30: The New Long-Only (2008) by A. Lo, P. Patel paper. 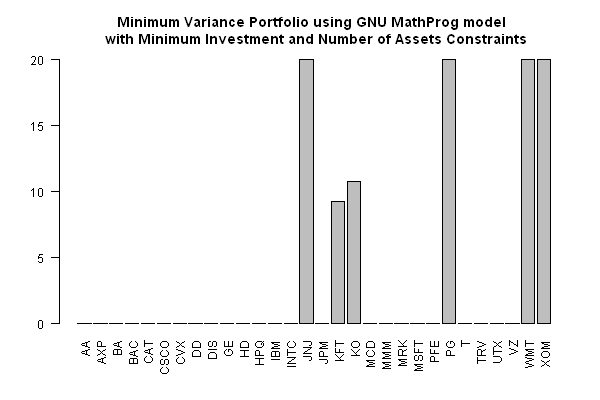 To model portfolio beta constraint, I will use the fact that portfolio beta is equal to the weighted average of the individual asset betas. Next, let’s construct 130/30 portfolio. I will restrict portfolio weights to be +/- 10% and will use portfolio construction technique that I documented in the 130/30 Portfolio Construction post. At this point, we created monthly long-only and 130:30 portfolios. Let’s examine their transition maps. The portfolio weights for the long-only portfolio (long.alpha) sum up to 100% and for the 130:30 portfolio (long.short.alpha) is 130% long and 30% short as expected. 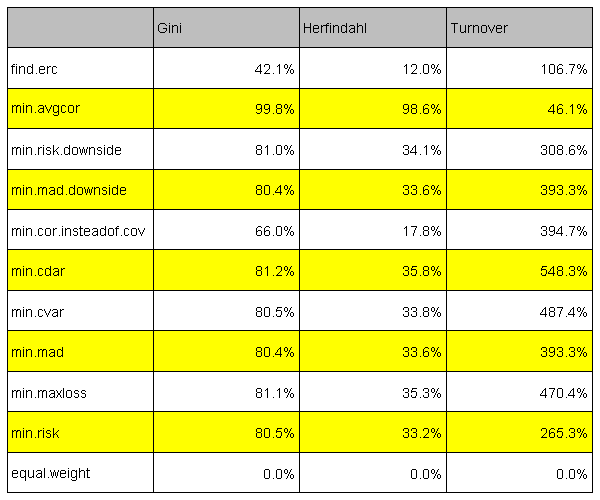 Next let’s create trading strategies based on these portfolios and check their performance. The 130:30 portfolio works best, producing high returns with smaller drawdowns than long-only and benchmark (1/N) portfolios. The note of caution: the above results are based on $0 commission rate (i.e. trading is free). Also, I’m using the current Dow Jones index components through out the whole history; hence, introducing survivorship bias (i.e. Dow Jones index changed its composition a few times in the last 20 years). 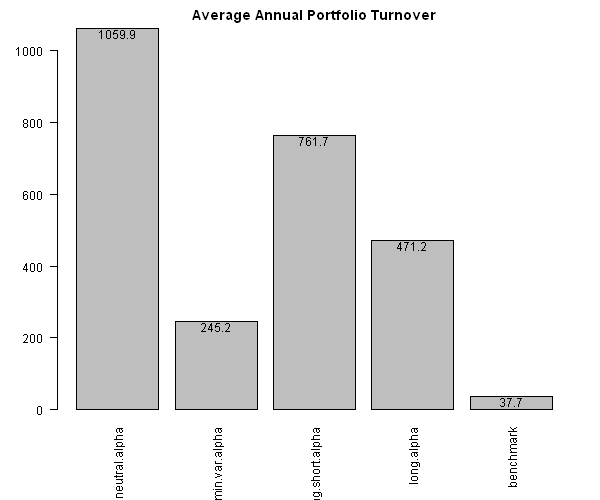 To see how much of the problem is my assumption of $0 commission rate, let’s have a look at the annual portfolio turnovers. The 130:30 portfolio has a pretty high portfolio turnover; therefore, it will not perform as well in the real life as in our backtest.